Hello to you! Hope you’re having a good week. Let me tell you, the weather here has been absolutely glorious. I’ve been trying to spend more time outdoors, enjoying the sun and the last little bits of summer, just tending to my plants and such. My hydrangeas are in bloom, so I’d thought I’d cut a few, style them up and take some photos in my dining room. Oh, I just love hydrangeas! When I bring them indoors, I always like mixing a few green blooms in with the white, even though they haven’t fully flowered, since I like the contrast and the texture. I decided that some pretty aqua-colored vintage jars would be perfect for my arrangements. I’ve had this old trug, carrier or whatever you want to call it for ages. I don’t know why I never thought to use it in here before. Sometimes I’m so blind. Do you do that too? You just get used to something being in a particular spot and never really notice it and it’s other possible uses? 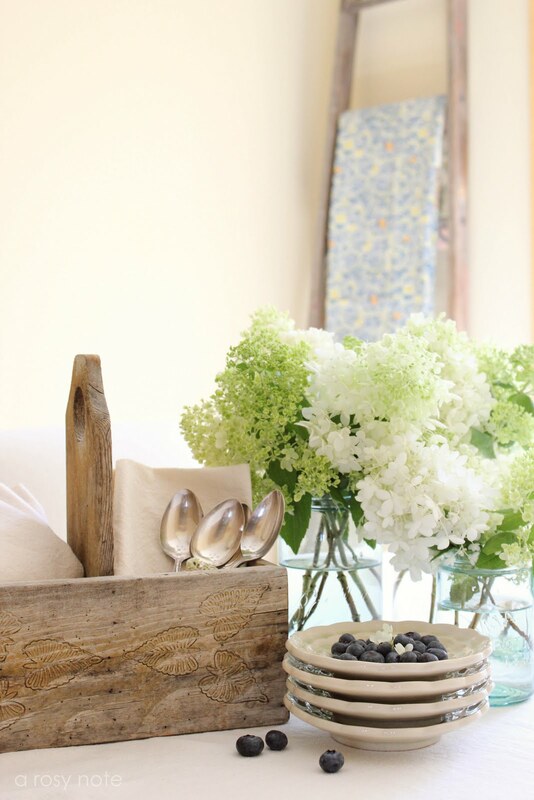 Anyway, it seems like the rustic look of the trug combined with the silverware and linens works well together, don’t you think? The vintage grain sack that usually hangs on the ladder was put away and replaced with one of my tablecloths instead for a nice little burst of color. Feels lots better…not so drab. 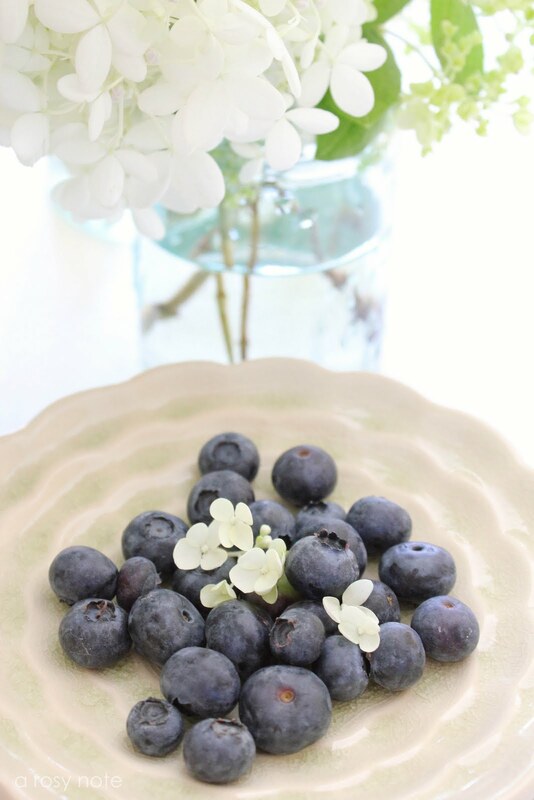 Of course, the blueberries brighten up the room too. Well, my lovelies, that’s all I have for ya…I’m not feeling super chit-chatty today. Hope you all have a wonderful weekend! Absolutely gorgeous!!! I always look forward to looking at your new posts…your photos, tablescapes & decor NEVER disappoint! 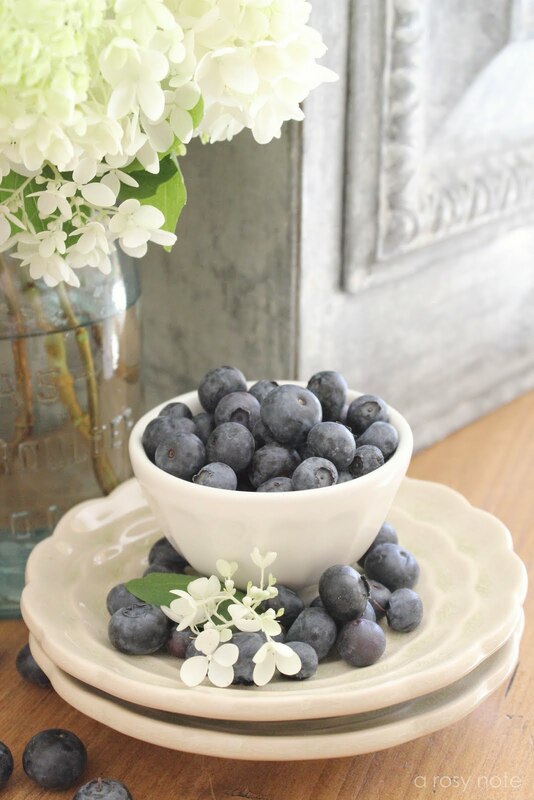 I love everything about it…the caddy, blooms, plates, blueberries, etc… Enjoy your upcoming weekend! Your photographs are beautiful! I love hydrangeas and they look just perfect in your turquoise jar. Beautiful shots – I love your compositions. Gorgeous! I love what you've done! Great job! your food photography is AMAZING! and so inspiring! Just beautiful!! I wish I could take photos like that, they are simply dreamy! Your hydrangeas are gorgeous. Your photos are beautiful of everything. I love your tablecloth on the table. I love Hydrangeas and yours are stunning. Such a beautiful compliment to the rest of the table setting. I really like the change from the grain sack to the tablecloth; just that perfect touch of color. Beautiful photos again Tricia! I love your hydrangeas. They look just like mine, but I never pick mine this early as they wither quite fast. Yours are gorgeous!!! I love hydrangeas and Your photographs are beautiful!!!!! Those are some huge blueberries! They look gorgeous with the white dishes. And yes, I do the same. Get in a rut with where my things are and then one day a light goes on! Your photos are stunning! I love the gorgeous hydrangeas too. I can't wait for summer so mine can start looking alive and healthy again! Everything is gorgeous, I adore hydrangeas, love the blueberries you added. Your home is so warm and inviting. They look too lovely to pass up. I love the colour of your hydrangeas!! I love hydrangeas, and the paler green ones are such a nice pleasant change from the blue or the pink ones. Your photography is gorgeous, and your dining room looks so peaceful. I hope you have a wonderful weekend, too! Oh, what a beautiful dining room! I love the way you have styled everything! Stunning photos, Tricia! Gorgeous flowers,a beautiful dinning room, and some great images. Beautiful, love the colors and textures in the shots. Tricia as always your photos are a delight! And how lucky you are to have fresh Hydrangeas from your very own Garden! 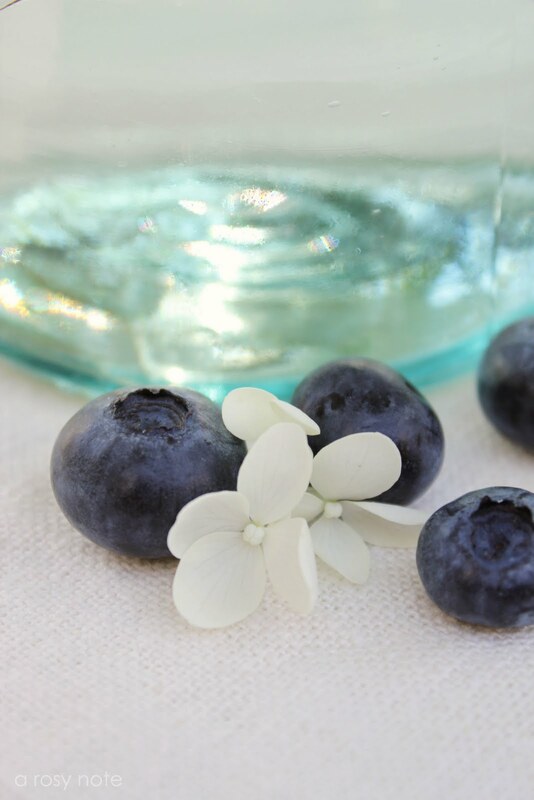 I've been enjoying Blueberries this week too… isn't it a shame there isn't more lovely Blue foods? Love these, you are just so clever with combining textures and colours! I especially love the first shot with the metal in the background. So lovely! Always enjoy visiting here! Beautiful photos! Just beautiful! Lovely photos and images. Have a wonderful weekend! So pretty..hope your summer is going well. they really added a touch of coziness and lots of gorgeousness in your home. Goodness! I love your blog so much! I can't help but, always come back and look at all the elegance, beautiful captured pictures you have taken! Love! Enjoyed these photos so much! You have a light, airy style that I love. Maybe even envy a little. 🙂 Hope you have a great weekend! 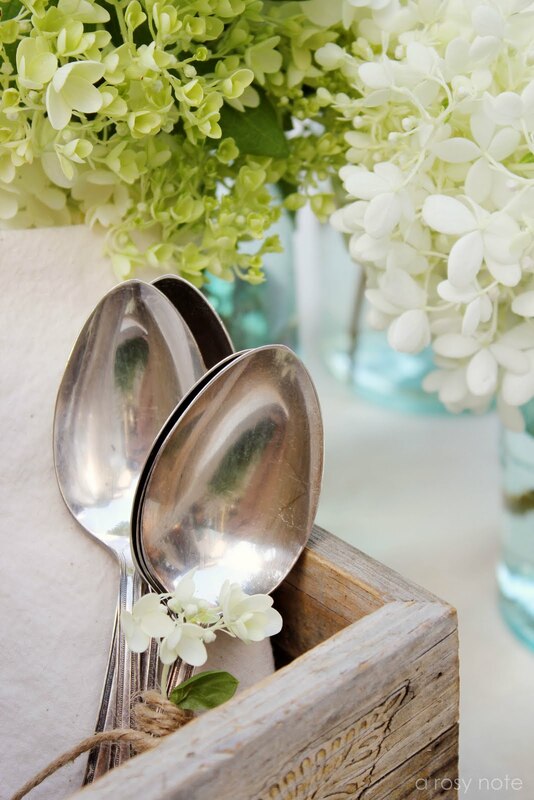 Absolutely beautiful hydrangea images….really love how you compose your shots, stunning. Have a wonderful weekend, Tricia. I so love your photography! The softness of it, the brightness and most of the amazing creativity as you compose all those shoots! You really are amazing! Beautiful, peaceful photos, full of summer beauty. Hydrangeas are one of my favorite flowers. I don't know how you came across my blog, but I'm glad you stopped by because it led me to yours! Everything is so beautiful here. I wish I could just dive into the screen! Beautiful photography as well! Did that high-end magazine call yet?? I HAVE THOSE DAY WHERE I DON'T FEEL LIKE CHATTING..LIKE YESTERDAY…I LOVE BLUEBERRIES..ALL YOUR PHOTOS ARE LOVELY…HAPPY FRIDAY HUGS. 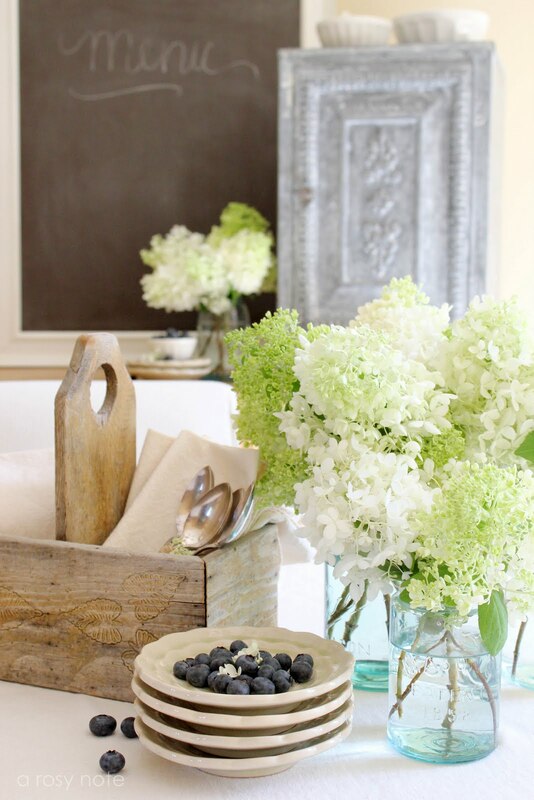 hydrangeas are my very favorite shrubs…so pretty and fun to cut and arrange indoors…you have created a lovely vignette in your space. A beautiful, white, enchanting space. I love the blueberries in the shots. I lived on a blueberry farm as a very young girl.. happy memories. I have quite a few hydrangea bushes but they are all too small too produce any decent amount of flowers yet. I did have one bush that showed real signs of promise but not enough to start picking from. Seeing your beautiful photos makes me look forward to next years harvest all the more!! What a lovely shabby chic dining room! Love what you did with the wooden carrier in the tablescape. Your photos are so pretty, too! I wish I could pull off this look, but my home just doesn't lend itself to this style. So I get my "fix" by looking at everyone else's gorgeous room settings. Yours included…. I just brought a bunch of hydrangea into the house today also. I've always loved your dining room, especially the pie safe. It all looks so beautiful! 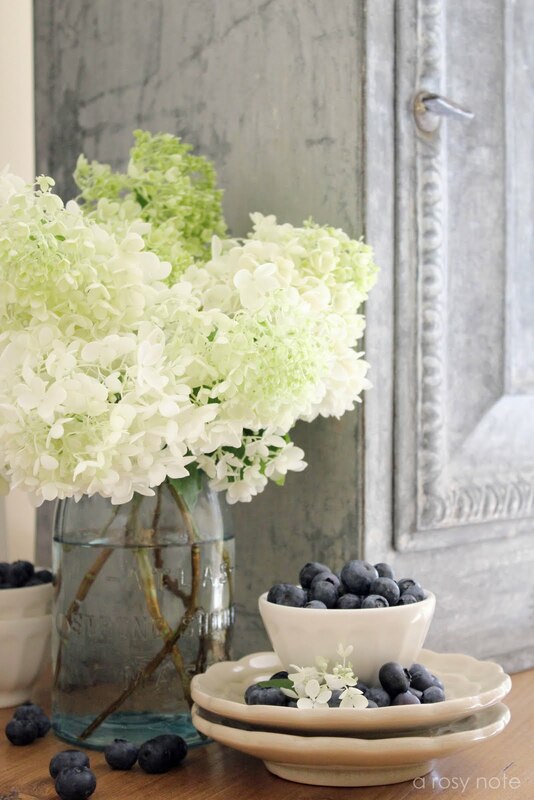 Such pretty hydrangeas – love them in jars! Your diningroom is gorgeous! I love the color fabric added to your ladder. I am all obsessed now with finding cute printed fabric – 1 yard only please 😉 for inexpensive napkins/linen since reading Helene's book. Your rustic caddy is great!! Hope you have a happy weekend! Absolutely gorgeous, Tricia! I love white hydrangeas. I have a few bushes and they're pink. I would love some white ones. Have a wonderful weekend! LOVE, LOVE, LOVE. Everything is so beautiful Miss Tricia. I hope you have an amazing weekend with your family. I'm working on my blog reading list…and you'll be on it. Each and every one of these is simply so beautiful Tricia! I love the compositions, and the light that you always capture is just gorgeous. Hope you are having a wonderful weekend too Tricia. I always leave here feeling like I have just walked through a beautiful home decor magazine! And I can even smell your beautiful hydrangeas. Beautiful photographer, beautiful home, beautiful designer, beautiful soul!!!!! These are farmhouse fresh to me, you should link up at Laurie Anna's too! BEAUTIFUL…your photos are always really special…you should be a professional, Tricia! I never think to mix flowers and fruit. Genius idea! Your home is gorgeous. I am so glad that the weather has been good and I hope you enjoy your week!! Dearest sweet tricia, each time i visit you here…i always feel so inspired by your gorgeous settings and beautiful photos! Your home is really so cozy and lovely! These hydrangeas are such beauty!! Such a sweet coincident that i just finished my new weekend tote bag design and i used a beautiful hydrangeas linen fabric for it! Have a lovely merry happy week and love to you sweet friend! Your styling and photography always take my breath away. I wish for a tenth of your talent! Hydrangeas are a favorite of mine also. Great idea to add a few that haven't bloomed all the way. I'll be following your lead on that one. I so love these set ups of yours. They are simple but I can't do them…trust me I have try to copied:) Ou well we can't do everything, I keep taking macro flower shots..I just get bored to them sometimes. Wow, such am amazing blog you've got here! your photos are so gorgeous and your dining room looks so beautiful! Absolutely stunning. Love your images. Just stunningly gorgeous at usual! Delightful images! Your work has a professional quality which I wish I could emulate! Such stunning shots!!!! Absolutely beautiful!! !